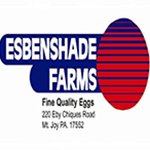 Esbenshade Farms | Favorite Foods, Inc.
Esbenshade Farms was established in 1963 on a farm just outside Manheim, PA by Glenn Esbenshade and his wife Rachael. For the first 17 years, this Lancaster county egg farm sold product to other processors. In 1980, our company’s first grading machine was installed on a farm purchased near Mount Joy, PA. This made it possible to begin marketing and distributing our eggs. What formerly existed as a Lancaster county egg farm with limited resources continued to broaden as a feed mill was built in 1985 on the Mount Joy site. Feed formulating and manufacturing for the farms’ chickens allowed for greater control over nutrition and costs. One thing that hasn’t changed since 1963 is our commitment to provide excellent care for our flocks health and well being. Today, our fully integrated company continues to expand and includes three modern layer facilities with in-line processing facilities for maximum freshness. We continue to be a top supplier to some of the finest wholesalers in the northeastern United States.